Religious poet of Germany, who lived at a period not later than 1546. He wrote a selihah (penitential poem) entitled , which is not to be confounded with a similar selihah by Kalonymus ben Judah (Zunz, "S. P." p. 255). In this poem, which consists of fifteen five-lined strophes, the author prays for the welfare of the king of the land in which he lives. 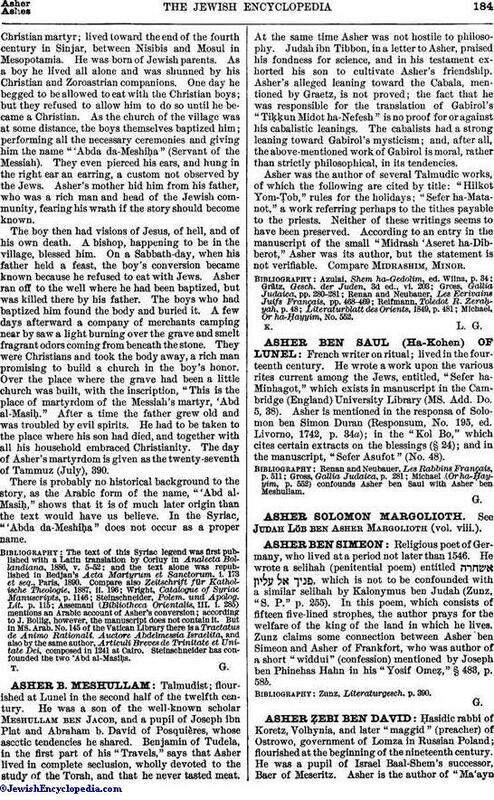 Zunz claims some connection between Asher ben Simeon and Asher of Frankfort, who was author of a short "widdui" (confession) mentioned by Joseph ben Phinehas Hahn in his "Yosif Omeẓ," § 483, p. 58b.